LANCING Football Club threw away a two-goal lead as they suffered a heavy home defeat against high-flying Dorking Wanderers in County League Division 1 on Saturday. Lancers led 3-1 after 30 minutes but Dorking hit six goals in the next hour as the hosts slipped to a third defeat in their last five league matches. 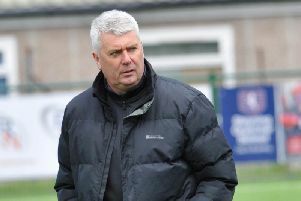 Lancing boss Richard Whittington was pleased with his side’s first-half showing but was once again disappointed with the goals his side conceded. He said: “I was really pleased with the way we played in the opening half-an-hour but, after that, it was not good enough. “To take a 3-1 lead against a side that I believe will go on to win this division was pleasing. I felt we were naïve defensively and gifted them four of their goals. “In this division, you will get punished against teams like this and we need to improve in defence in the weeks to come. Dorking opened the scoring on seven minutes when Kevin Terry looped an effort over Callum Fidler in the Lancing goal. Lancing were the better side after conceding and their dominance was rewarded with three goals in five minutes. Alex Fair levelled for the home side after Dorking failed to clear a Dan Turner corner. Lewis Finney then fired Lancing in front on 26 minutes as he cut inside and lashed his effort into the bottom corner for his 18th goal of the season. Fair then rounded off a remarkable five-minute spell with his second to fire Lancing 3-1 ahead. Dorking pulled a goal back just five minutes later, though, when Ben Dyett was left unmarked and headed home from a corner. Liam Hunter then bagged his first of the game three minutes before the break to make it 3-3. Dorking showed why they are contenders to lift the Division 1 title with a dominant second half performance. Terry struck twice in eight minutes to complete his hat-trick and put Wanderers 5-3 ahead with 30 minutes still to play. There was to be another hat-trick for the visitors as Hunter struck in the 64th and 77th minutes to round off a fantastic win for the away side. The defeat saw Lancing slip to 15th in the table and they are now just four points above the relegation zone. Lancing travel to Broadbridge Heath on Saturday. LANCING: Fidler; Mills, Fenton, Phillips, Sharman; Hendy, Rouane, Turner, Callaghan; Fair, Finney. Subs: Adams (Phillips), Davis (Callaghan), Robertshaw (Turney), Spinks, Ford.